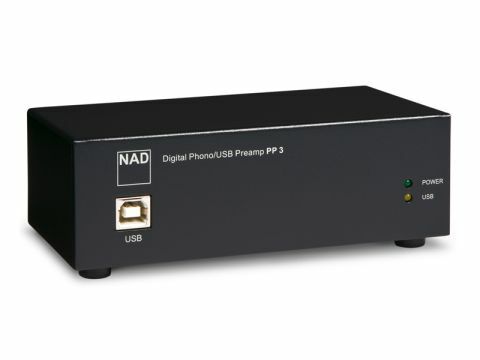 NAD's PP2 is a long-established leader among super-budget phono stages, but the PP3 Digital is something a little different, offering as it does a digital output. At what is still a very affordable price, it actually has a very attractive feature set, with both MM and MC inputs and even a line input (for digitising and feeding to your computer). The MM and MC stages are separate circuits. Digitising is carried out at the usual USB maximum of 16-bit/48kHz and if you don't have suitable software already installed on your computer, you can use the supplied 'VinylStudio Lite' for the basics. Options don't stretch to adjustable loading, but the standard value of 47k applies to the MM input, with about 70 ohms at the MC input. Gain is relatively low at 35dB (MM) and 55dB (MC), which may require your volume control to be wound up a bit but will certainly avoid overload. Components are all surface-mounted, a necessity given the number of them in the small space. Despite the low price, this unit turned out to have the lowest noise of all four in this group when fed with an MC cartridge. That may well account for its particularly detailed sound with an MC source, which makes it very informative. It presents the detail in a rather understated way, which may be something of a question of taste: we took to it at once but some listeners may find it a bit deadpan and undemonstrative beside, for instance, the Firestone Audio Korora. MM cartridges give a slightly less detailed sound, but the basically laid back character remains. Tonally the unit is even, with very slightly dry treble, but well-extended bass. The digital output works well, but beware hum loops with desktop computers.